Click on a question to expand and see the answer. 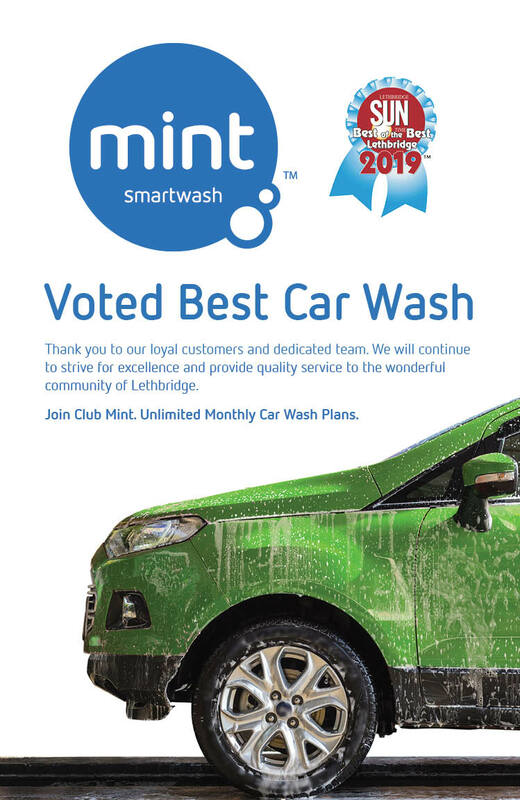 You will be greeted by our friendly, professional Mint Wash associates who will guide you through the simple Smartwash process. Put your vehicle in neutral when asked and relax! We’ll do the rest. We clean the vehicle exterior with gentle touch washers and mild cleaning solutions. Your wheels will be cleaned, and your vehicle will be rinsed and gently dried with our exclusive hot air drying system – all automatically, in five minutes or less! For safety reasons, there must be a driver at the wheel. All Mint Smartwashes use extensive lighting and lots of glass, to create a comfortable, wide-open environment. We’ll give you easy to follow instructions, answer any questions you might have, and guide you through the process. Mint Smartwash offers exterior-only service. We do provide complimentary self-service, super-powered, vacuums at all our locations. All locations have extra equipment for state-of-the-art machine-fed mat cleaning at no extra charge. Almost certainly, yes! If you ever have any questions, please feel free to come by any of our location and we’ll be happy to check your vehicle for problem areas. Here are a list of vehicles that might not be able to fit. · Vehicles that sit 4.5″ or lower to the ground. · Vehicles with tires wider than 13″. · Vehicles taller than 84″. · Vehicles with permanently affixed tri-pod style mirrors. · Open bed pickup trucks with debris, tools, straps, rope or any other loose materials. · Vehicles with large ladder racks. · Vehicles with ski or luggage boxes on top. Will my cracked windshield be safe in the wash? Yes however once the windshield glass is compromised by cracks or chips it becomes more susceptible to changes in temperature. While you may wash your car with windshield damage they may expand so it is always best to repair a damaged windshield right away! What’s the difference between “brushless” and “touchless”? We employ a brushless process, using only soft foam fingers that gently washes the surface of your car in combination with safe, biodegradable shampoos and cleaners. “No Touch” operations, on the other hand don’t use direct-contact cleaning media. Yes. We accept VISA, MasterCard, American Express and Discover Card. Is it safe to wash alloy wheels? Yes! Car markers usually cation against automatic washes because they use acids and carbon or plastic brushes which can scratch. Here at Mint Smartwash we use no such acids and only our soft foam fingers to wash your car so your wheel are perfectly safe with us! Will my antenna be okay? Aftermarket products such as CB and cell phone antennas should be removed before washing, when you arrive we will do our best to have our wash attendants remind you! Almost certainly. All we ask is that the pickup bed be empty before going through the wash. This is for the safety of your vehicle, and those of other customers. Also, some side-mirrors are incompatible with our process, and certain types of modifications that employ oversized or off-road tires or radically raised suspensions may not be compatible. Here at Mint Smartwash we use the best; Turtle Wax! Turtle Wax uses cutting edge technology and produce innovative products to meet all our client’s needs. We have a custom-designed “drying area” at the end of our wash process that uses heated air to dry your vehicle – without having to touch your car. You won’t need to hand-dry your vehicle (although if you want to bring along your own towel and give it a final detail before you leave, feel free to pull into our vacuum area and give your newly-clean car some personal attention). We’re always on the lookout for good people to join our team! Contact us to inquire about job opportunities, or stop by and visit our front office.